Monday's severe thunderstorms spawned at least a half-dozen tornadoes seen by storm spotters and also produced small hail through much of the Metroplex on Monday. The twisters and funnel clouds Monday afternoon were weak and, for the most part, struck open country south of the Dallas-Fort Worth. In Ellis County, five people were reportedly left homeless when a suspected tornado tore the roof from their mobile home in Avalon, said John Patterson, the county's emergency management coordinator. The people live next the high school in Avalon and took shelter in the school's domed gymnasium. The school sustained roof damage, but the gym was not damaged. NBCDFW viewer Adam Randolph sent in this video of a tornado near the town of Three Way, in between Stephenville and Glen Rose. Patterson said six to eight other homes were also damaged. 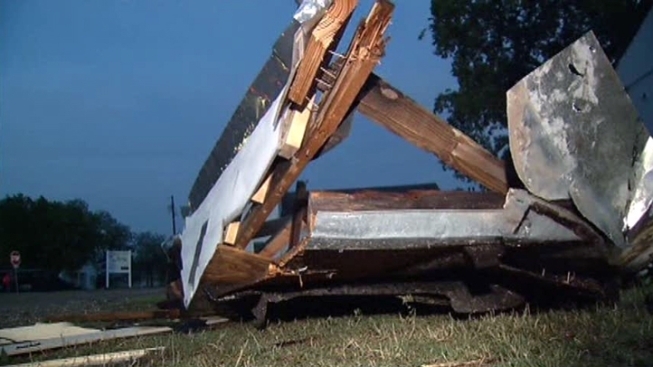 In Navarro County, a volunteer firefighter reported that a shed blew over in the eastern part of the county. Downed trees and damage to barns and buildings north of Blooming Grove were also reported. Erath County Sheriff Tommy Bryant said a barn and a vacant home were destroyed on FM 205 near Stephenville. No injuries were reported. 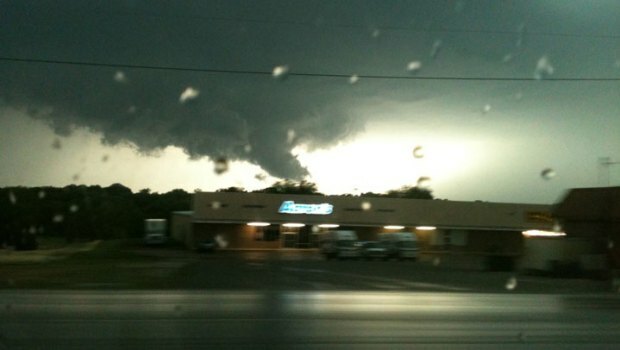 A funnel formed briefly around midafternoon Monday about 30 miles southwest of Fort Worth, between Cleburne and Glen Rose. It was unclear how long it was on the ground, but spotters reported that it touched down briefly. 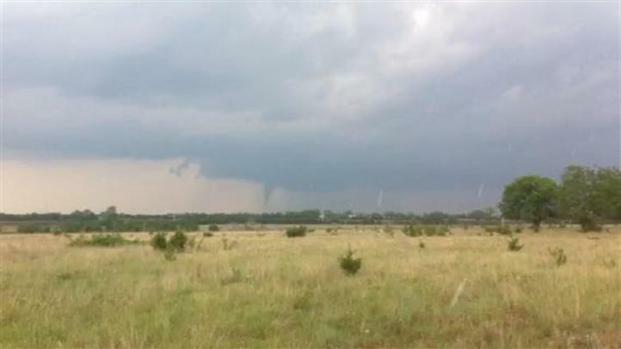 A thin, rope-like funnel was later seen near Itasca, about 50 miles southwest of Dallas. By the early afternoon, the storms sparked large hail, severe thunderstorm warnings and tornado warnings across much of North Texas. Golf ball-sized hail was reported over Glen Rose. Hail reports varied from marble- to tennis ball-sized and were widespread across the Metroplex. The storms were associated with an atmospheric boundary between moist and dry air and a stationary front that has been oscillating between North Texas and southern Oklahoma. National Weather Service meteorologist David Huckaby in Fort Worth said the storm was cyclical, meaning that as one end was losing strength, the other end was regenerating. That kept the storm raging all afternoon long until after sunset, when the heat that fueled it was lost. However, Huckaby said more of the same was expected Tuesday in North Texas. By Wednesday, quiet weather is expected to return and stay until the end of the work week. Outside of North Texas, multiple suspected tornadoes were reported in and around Crockett in East Texas at about 9:30 p.m. Widespread damage was reported countywide, but the severity was unclear because many affected areas were without power, Houston County Fire Marshal David Lamb said. Many trees also had been blown down, either by tornadoes or straight-line winds, he said. NBCDFW's David Finfrock, Grant Johnston, Remeisha Shade and Scott Gordon contributed to this report.